#AcBookWeek: What will the Academic Book of the Future look like? Bristol responds…! Posted on November 27, 2015 by academicbookfuture	in academia, Academic Book Week, libraries, publishing and tagged Damien McManus, Great Debate, Helen Fulton, Katharine Reeve, Leah Tether, University of Bristol. This guest post is written by Dr Leah Tether (University of Bristol), who reflects on the debate that took place at Bristol as part of #AcBookWeek. On Tuesday 10th November 2015, as part of Academic Book Week, we at the University of Bristol were delighted to host a panel discussion with an audience Q&A. The event aimed to offer some answers to one of the central lines of enquiry of The Academic Book of the Future Project – what format our future academic books might take. Our three-strong speaker panel consisted of an academic, a librarian and a publisher, all of whom – we knew – would bring something different to the debate. The offering of this great mix of views led to a fantastic turn-out (with people even sitting on the floor! ); audience members came from a wide range of backgrounds: in addition to reflecting the make-up of the panel with publishers, academics and librarians, there were undergraduate and postgraduate students, as well as interested members of the public. All of these, of course, are key stakeholders in the wider debate – all will be affected by developments to the academic book – so their vested interests made for an impassioned and rich discussion. Our first speaker, Professor Helen Fulton (Chair in Medieval Literature, University of Bristol) showed how she had already embraced digital outputs in previous research projects. She used the example of the Mapping Medieval Chester project as a case study for how digital publications can both facilitate collaborative research and pave the way for different kinds of relationships between publishers and universities. She viewed project websites as often representing non-linear equivalents to monographs in terms of their scope and content. She also argued that these can be relied on for quality where support for the project in question has been provided by a recognised body (such as, but not limited to, the AHRC), due to the rigorous peer-review to which such projects have been subjected. The second speaker, Damien McManus, spoke from his perspective as the Subject Librarian at the University of Bristol for Classics and Ancient History, English, French, German, Linguistics and Russian Studies. Damien focused on the breaking down of content into smaller units (chapters or sections) that is being encouraged by digital and emphasised the potential benefits of accessibility, affordability and sustainability. In practice, though, he recognised that many issues still exist in terms of the library provision of digital academic resources. He cited single-use licences, complicated and divergent user instructions for different platforms, cost implications and the last-minute withdrawal of resources by publishers as key amongst the problems. Damien also wanted to make clear that many resources are simply not available in digital form as yet, so from his perspective – even where issues with digital are ironed out – resourcing will remain mixed for some considerable time to come. The third and final speaker was Katharine Reeve, formerly the Editorial Director and Senior Commissioning Editor for History and Visual Arts at Oxford University Press. 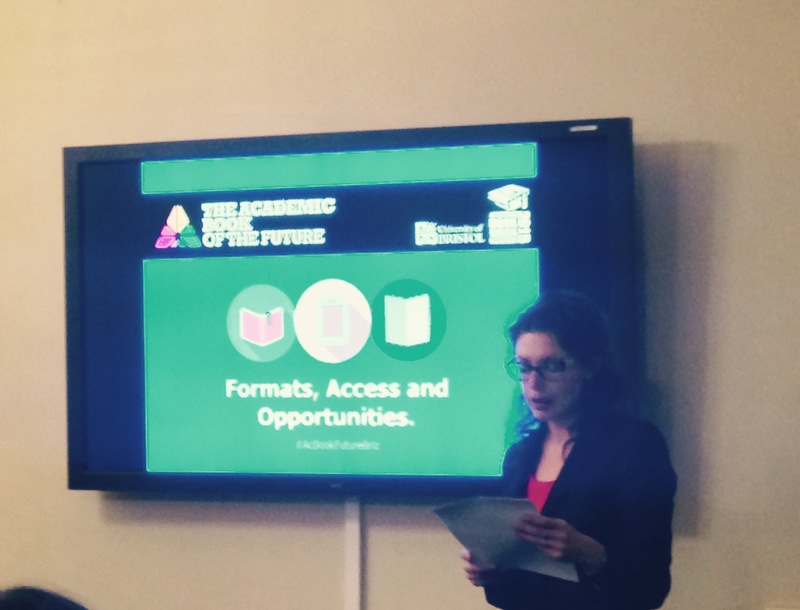 As part of The Academic Book of the Future Project, Katharine has been researching the changing role of the editor in academic book publishing, and she revealed to the audience some of the results of that research. She highlighted that, despite the obvious importance of the close interaction of editor with author in producing the best possible product, editors are increasingly being pulled away from the hands-on side of their role, thus becoming a less visible part of the process. This, she suggested, risked an undervaluing of the editor in the quality control side of publishing, and that she could see this already happening with the opportunities of digital publishing offerings authors the choice to circumvent traditional publication in favour of dissemination via the web. She argued that we need to reinvigorate the role of the editor in digital publication, and understand that – no matter what the format – the academic book of the future still needs to be rigorously processed before it is made available to the reading public. These richly diverse views provoked a fantastic response from our audience, which took the debate in many important directions. Key amongst these were the opportunities for greater interaction between libraries and publishers, the perceived values (by the Research Excellence Framework and funding bodies, for example) of different kinds of publications (collected volumes vs. monograph); whether innovative digital formats would ever be valued as highly as traditional formats; the funding models surrounding open access and how that would impact different kinds of institutions; the reading practices of young scholars (skimming vs. deep reading); how publishers and higher education institutions could work together more closely to develop products that more closely fulfil the needs of book consumers. In my role as chair, I was delighted to see such an engaged response to the subject at hand – people really cared about the formats our academic books might take and, perhaps surprisingly, most believed that digital – on the whole – offered more opportunities than hindrances, especially when used as a supplement to traditional publication. Indeed, Katharine Reeve’s suggestion that the best academic book of the future might actually be one offering multi-platform functionality (i.e. a traditional monograph at the heart of the project, but with digital add-ons such as video interviews, apps and social media marketing) was perhaps the most warmly received suggestion of the night. Where our varied Bristol audience was in total agreement, though, was in emphasising that the process of producing academic outputs needs to remain as rigorous as it ever has been – digital should not be allowed to dilute the integrity of academic research, but rather be used as a tool for assisting with its wider dissemination and engagement – a supplement as opposed to a replacement. Dr Leah Tether is the Senior Lecturer in Digital Humanities at the University of Bristol. Posted on November 26, 2015 by academicbookfuture	in Academic Book Week, academic books, libraries, Open Access, publishing and tagged copyright, Emma Brennan, Frances Pinter, Francesca Billiani, george walkden, Great Debate, Guyda Armstrong, Knowledge Unlatched, Marilyn Deegan, Sandra Bracegirdle, third party content, University of Manchester. 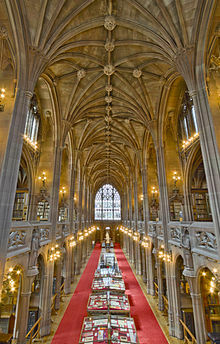 On Wednesday 11th November, the John Rylands Library, Manchester, played host to the Manchester Great Debate, a panel discussion dedicated to addressing the future of the academic monograph. The event was one of over sixty organised during Academic Book Week to celebrate the diversity, innovation, and influence of the academic monograph. While opinions remained varied, with panel representatives from both sides of the fence, the discussion always seemed to return to a few key thematic strands. How are people using books? How are people encountering books? And what future lies ahead for the academic book? Melek Karatas, Lydia Leech, and Paul Clarke (University of Manchester) report here on the event. It was in the stunning Christie Room of the Rylands Library that Dr. Guyda Armstrong, Lead Academic for Digital Humanities at the University of Manchester, welcomed the audience of publishers, academics, librarians, early career researchers, and students with a shared concern for the future of how the humanities might be produced, read, and preserved over the coming years. Five panellists were invited to present their case to the group before the floor was opened and the debate got into full swing. The session was chaired by Professor Marilyn Deegan, Co-Investigator of The Academic Book of the Future project. She began by outlining the project’s main objectives and its future activities, details of which can be found at www.academicbookfuture.org. Before commencing with the presentations she asked the audience to quite simply reflect on what they conceived of when trying to define the book. It was this question, with its rather complex and capacious ramifications, that was the fundamental core of the Manchester Great Debate. The first of the panellists to present was Frances Pinter, CEO of Manchester University Press. Since print runs of academic books have decreased in volume and their prices increased beyond inflation, she firmly believes that the future of the academic monograph will be governed by the principles of Open Access (OA). She contends that although the journey to OA will be difficult, drawing on the Crossick report to highlight such obstacles as the lack of a skilled workforce and the high cost of publication, it is impossible to deny the potential of the digital age to advance knowledge and maximise discovery. She identified Knowledge Unlatched, a not-for-profit organisation dedicated to assisting libraries to co-ordinate the purchase of monographs, as a pioneer in overcoming some of these obstacles. Under the scheme, the basic cost of publication is shared, and the works are made readily available as a PDF with an OA license via OAPEN. An initial pilot project saw the publication of twenty-eight new books at the cost of just $1,120 per library. The digital copies of these books were also downloaded in a staggering 167 countries worldwide, a true testament to the benefits of the OA monograph. Emma Brennan, Editorial Director and Commissioning Editor at Manchester University Press, followed with a convincing argument against the financial restraints of contemporary academic book publishing. The system, she claims, is fundamentally broken, favouring short-form sciences over the humanities. A key to this problem lies in the steep rises in purchase prices over recent years, with the result that a monograph, which once sold for around £50 in a run of five hundred copies, is now sold for upwards of £70 and oftentimes on a print-on-demand basis. However, more crucial still is the disparity between authorial costs and corporate profits. After all, typical profit margins for article processing charges (APCs) reached an astonishing 37% in 2014, undeniably privileging shareholders over authors. Under this current system, university presses are only ever able to operate on a not-for-profit basis whereby surplus funds must necessarily be reinvested to cover the costs of future APCs. Such a fragile structure can only continue in the short-term and so the need for a drastic upheaval is undeniable. Next to present their case was Sandra Bracegirdle, Head of Collection Management at the University of Manchester Library. Through a variety of diagrams she was able to highlight a number of curious trends in the reading habits of library users. A particularly interesting point of discussion was the usability of both electronic and print resources amongst student readers. While those who tended to prefer the former valued the mobility of text and the equality of access, readers of the latter tended to prefer the readability of the physical text. Interestingly, 50% of the students questioned said that they were more likely to read a book if it were available digitally, suggesting that “access trumps readability”. The decreased popularity of physical books is reflected further still by the fact that 27% the books held within the library have not been borrowed for some ten years. She continued to suggest that the increased popularity of electronic formats, on the other hand, might be the result of a change in the way people use and encounter information, arguing that different book forms engender different cognitive styles. While she did not appear to have a strong predisposition one way or the other, she did point out the “emotional presence” of a physical book by concluding with a note from Cicero: “a room without books is like a body without a soul”. She was followed by Dr. Francesca Billiani, Director of the Centre for Interdisciplinary Research in Arts and Languages (CIDRAL) at the University of Manchester. She fundamentally contends that the materialization of knowledge has in recent years changed beyond recognition and as such so the academic monograph must also adapt. After all, the book is no longer a stand-alone piece of writing for it is firmly rooted within a digital “galaxy of artefacts” comprising blog posts, photos, and videos. Many readers no longer rely exclusively on the academic book itself in their reading of a subject, nor will they necessarily read the work in its entirety choosing instead to read what they consider to be the most relevant fragments. Academics need to embrace these changes in their future writing by composing their monographs in a way that accommodates the new methods of knowledge dissemination. Yet, at the same time, she remained mindful of the fact that the monograph of the future must also retain its academic rigour and avoid falling into the trap of eclecticism. The last of the speakers to present was Dr. George Walkden, Lecturer in English Linguistics at the University of Manchester. A self-proclaimed Open Access activist, he claims that academic books should not only be free in terms of cost but also in terms of what readers can do with them. He lamented those individuals who, in such a climate of exhaustive copyright limitations, are all too readily branded as pirates for attempting to disseminate knowledge publicly. Although he remains sceptical of what these individuals share with the “cannon-firing, hook-toting, parrot-bearing sailors of the seven seas”, he believes that such labelling elucidates the many issues that have constrained both historic and modern publication practices. In the first instance, publishers should value the transmission of knowledge over their own profitable gain. But, perhaps more crucially, it must be acknowledged that the copyright of a work should remain with its author. He fundamentally contends that academics predominantly write to increase societal wealth and readership, a mission that can only ever really be achieved through the whole-hearted acceptance of Open Access. Once all of the panellists had concluded their presentations, the floor was opened to the audience and a stimulating debate ensued. One of the most contested issues to arise from the discussion was the ownership of copyright. Many institutions actually hold the copyright of works produced by academics whose research they fund, although they do not always choose to exert this right. Walkden questioned to what extent this practice effectively safeguards the interests of academics, particularly since it is oftentimes too costly for them to even justify challenging this. He argued that academics should be granted the power to make decisions concerning their own intellectual property, particularly regarding the OA nature of their work. Copyright issues were complicated further by a discussion of Art History monographs, particularly with regards to third party content. The case of Art History is particularly curious since, as Brennan highlighted, print runs have continued to remain reasonably high. After all, many art historians tend to opt for physical books over their digital counterparts since problems can often arise with their visual reproductions if, for instance, the screen is not calibrated to the original settings used in its creation. The discussion then turned to the resurgence of a material culture, whereby consumers are returning to physical artefacts. The increased popularity of vinyl records in today’s digital music society was used to illustrate this point. It was nevertheless argued that such a comparison was counterproductive since consumers ultimately have the freedom to decide the medium through which they access music but do not always have this choice with regards to books. Perhaps the academic book of the future will permit such freedom. A member of the audience then identified the notable absence of the student in such a discussion. Academics, both on the panel and in the audience, expressed concerns that students were able to access information too easily by simply using the key word search function to find answers. Many felt that the somewhat lengthy process of physically searching out answers was more valuable to developing their research skills. Students within the audience said that while they do like the speed with which they are able to process information, they also value the experience of going to bookshelves, possibly finding other items they had not initially set out to obtain. An interesting discussion followed on whether technology might ever be able to replicate the experience of a physical library, and to what extent learning can be productive within a digital environment. While the future of the academic book remains unclear, certain issues materialise as central topics of debate. Concerns for copyright, visual reproductions, and third party content, for instance, must necessarily form a basis of this future discussion. But more so than this, authors must begin to write within the context of a rapidly emergent digital world by ensuring that their academic outputs engage precisely with new technological formats and platforms. The opening of the book has only just begun, and perhaps it is only through investment and interdisciplinary collaboration that the academic monograph will have a future. Melek Karatas, Lydia Leech, and Paul Clarke are postgraduate students in medieval and early modern languages at the University of Manchester, with research interests in manuscript and print cultures of the literary book. Posted on November 12, 2015 by academicbookfuture	in academic books, digital, Open Access, Publishers, publishing and tagged academic book week, academic linguistics, copyright, george walkden, open access. This is a repost from George Walkden’s personal blog about Open Access in the context of academic linguistics. The original post can be found here. I think academic books should be free. It’s not a radically new proposal, but I’d like to clarify what I mean by “free”. First, there’s the financial sense: books should be free in that there should be no cost to either the author or the reader. Secondly, and perhaps more importantly, books should be free in terms of what the reader can do with them: copying, sharing, creating derivative works, and more. Another thing I’ll be assuming is that technology does change things, even if we’re rather it didn’t. If you’re reluctant to accept that, I’d like to point you to what happened with yellow pages. Or take a look at the University of Manchester’s premier catering space, Christie’s Bistro. Formerly a science library, this imposing chamber retains its bookshelves, which are all packed full of books that have no conceivable use to man or beast: multi-volume indexes of mid-20th-century scientific periodicals, for instance. In this day and age, print is still very much alive, but at the same time the effects of technological change aren’t hard to spot. With those assumptions in place, then, let’s move on to thinking about the academic book of the future. To do that I’m going to start with the academic book of the past, so let’s rewind time by three centuries. In 1710, the world’s first copyright law, the UK’sStatute of Anne, was passed. This law was a direct consequence of the introduction and spread of the printing press, and the businesses that had sprung up around it. Publishers such as the rapacious Andrew Millar had taken to seizing on texts that, even now, could hardly be argued to be anything other than public-domain: for instance,Livy’s History of Rome. (Titus Livius died in AD 17.) What’s more, they then claimed an exclusive right to publish such texts – a right that extended into perpetuity. This perpetual version of copyright was based on the philosopher John Locke’s theory of property as a natural right. Locke himself was fiercely opposed to this interpretation of his work, but that didn’t dissuade the publishers, who saw the opportunity to make a quick buck (as well as a slow one). Fortunately, the idea of perpetual copyright was defeated in the courts in 1774, in the landmark Donaldson v. Becket case. It’s reared its ugly head since, of course, for instance when the US was preparing its 1998 Copyright Term Extension Act: it was mentioned that the musician Sonny Bono believed that copyright should last forever(see also this execrable New York Times op-ed). What’s interesting is that this proposal was challenged at the time, by Edinburgh-based publisher Alexander Donaldson – and, for his efforts to make knowledge more widely available, Donaldson was labelled a “pirate”. The term has survived, and is now used – for instance – to describe those scientists who try to access paywalled research articles using the hashtag #ICanHazPDF, and those scientists who help them. What these people have in common with the cannon-firing, hook-toting, parrot-bearing sailors of the seven seas is not particularly clear, but it’s clearly high time that the term was reclaimed. If you’re interested in the 18th century and its copyright trials and tribulations, I’d encourage you to take a look at Yamada Shōji’s excellent 2012 book “Pirate” Publishing: the Battle over Perpetual Copyright in eighteenth-century Britain, which, appropriately, is available online under a CC-BY-NC-ND license. And lest you think that this is a Whiggish interpretation of history, let me point out that contemporaries saw things in exactly the same way. The political economist Adam Smith, in his seminal work The Wealth of Nations, pointed out that, before the invention of printing, the goal of an academic writer was simply “communicating to other people the curious and useful knowledge which he had acquired himself“. Printing changed things. Let’s come back to the present. In the present, academic authors make almost nothing from their work: royalties from monographs are a pittance. Meanwhile, it’s an economic truism that each electronic copy made of a work – at a cost of essentially nothing – increases total societal wealth. (This is one of the reasons that intellectual property is not real property.) What academic authors want is readership and recognition: they aren’t after the money, and don’t, for the most part, care about sales. The bizarre part is that they’re punished for trying to increase wealth and readership by the very organizations that supposedly exist to help them increase wealth and readership. Elsevier, for instance, filed a complaint earlier this year against the knowledge sharing site Sci-Hub.org, demanding compensation. It beggars belief that they have the audacity to do this, especially given their insane 37% profit margin in 2014. Publishers should be mission-oriented, and that mission should be the transmission of knowledge. Funding should come neither from authors nor from readers. There are a great many business models compatible with this. Copyright should remain with the author: it’s the only way of preventing exploitation. In practice, this means a CC-BY license, or something like it. Certain humanities academics claim that CC-BY licenses allow plagiarism. This is nonsense. How far are we down this road? Not far enough; but if you’re a linguist, take a look atLanguage Science Press, if you haven’t already. In conclusion, then, for-profit publishers should be afraid. If they can’t do their job, then academics will. Libraries will. Mission-oriented publishers will. Pirates will. It’s sometimes said that “information wants to be free”. This is false: information doesn’t have agency. But if we want information to be free, and take steps in that direction… well, it’s a start. Note: this post is a written-up version of a talk I gave on 11th Nov 2015 at the John Rylands Library, as part of a debate on “Opening the Book: the Future of the Academic Monograph”. Thanks to the audience, organizers and other panel members for their feedback. Posted on November 12, 2015 by academicbookfuture	in academic books, reading and tagged 20ABCWorld, emily tee. The list of 20 Academic Books that Changed the World is now closed but had been open to public vote to choose the most influential academic book of all time. The list of 20 books, spanning a wide range of subjects, including science, philosophy, religion, feminism and literature, was generated and voted for by leading academic booksellers, librarians and publishers. Its announcement has sparked debate and prompted questions around what an academic book is. This guest post has been submitted by a member of the public, Emily Tee, and offers one reaction to the list. This post was written before the announcement of the winner. Public voting is now closed and the winner has been announced! On the Origin of Species by Charles Darwin gained the most votes. Whilst I am eager to find out the winner, I am slightly reserved about the decision-making process behind voting. For me, I have only entirely read one of the texts (George Orwell – Nineteen Eighty-Four), and extracts from around five or six others. I’m immediately on the back foot. How many others will be in a similar situation to me? Will this add a certain bias to the voting? There will be very few individuals who have read all 20 texts, and therefore few who can submit a subjective vote. The subject areas of the nominations are so varied that people are likely to vote for books within the subject that they are interested in or their specialist area. For me, that would be The Complete Works of Shakespeare. Shakespeare has shaped and influenced the arts and literature world in a way that no other within the subject area has, however, has he been as influential on the world as Einstein or Darwin? I would argue that he probably hasn’t. Significantly, there are only four women on the list. Three of those are writing about feminism, which seems rather niche compared to the male-authored books on the list. Although feminism is important, some variety would have been welcomed. The list is also dominated by English speakers. Could it be culturally biased, or is this bound to happen in a world where the English language is dominant? Plato explained to us why we need justice in ‘The Republic’. All of these touch on pivotal moments in the world’s history and it’s academic progress, ranging from 380BC to the present day. I am now a few steps closer to determining which book I’m going to vote for, but I’ll have to wait until Academic Book Week in November to find out the winner. Emily Tee, 27, is a lifelong reader, writer and reviewer of books. Currently working for a large international organisation in the professional area of business proposal writing. Whilst juggling life with two young children, she reads and recites stories on a daily basis and shares her thoughts on them via her personal blog, which also includes her original poetry and short stories. This year she has started to study towards a BA in English Literature and Creative Writing. Posted on November 9, 2015 by academicbookfuture	in academic books, conference, Digital Humanities, Open Access, reading and tagged academic book week, bristol, cambridge, cardiff, dundee, edinburgh, glasgow, hertfordshire, leicester, liverpool, london, manchester, nottingham, seminar, sheffield, stirling, sussex, symposium. Academic Book Week (9-16 Nov) is next week! With a constellation of events being showcased all around the UK from Sussex to Edinburgh, this week highlights the wonderful work done by booksellers, libraries, academics, and publishers, and discusses the academic book across a spectrum of perspectives. Here we have collected events by location so scroll through to see what is happening near you! We have also just announced some competitions and offers that will be happening during the week! Including but not limited to winning an #AcBookWeek tote bag, winning a special leather-bound edition of “The Complete Works of Shakespeare”, and 50% of all academic books and classics at Southcart Books. Find out about them more on this page and keep checking because more are being added all the time! Cambridge will be hosting an exhibit for the entire week at the University Library, presenting a selection of books showing examples of the way readers have interacted with their textbooks from the fifteenth to twentieth centuries. And on the 9th November Dr Rosalind Grooms and Kevin Taylor explore how Cambridge has shaped the world of academic publishing, starting way back in 1534. There are four events taking place in Oxford throughout the week. On the 9th November Frank Furedi, Professor of Sociology at University of Kent, discusses his new book “The Power of Reading”. Furedi has constructed an eclectic and entirely original history of reading, and will deliver a similarly exciting discussion on the historical relevance of the reader. Peter Lang Oxford are showcasing a book exhibit presenting the past and present of the academic book from the 9th-16th November, this event requires no registration so just drop in anytime to have a look! On the 11th November Peter Lang again presents J. Khalfa and I. Chol who have recently published “Spaces of the Book”, exploring the life of books ‘beyond the page’. This launch will be followed by a drinks reception and discussion of the aforementioned week-long exhibit. The Oxford events culminate on the 12th November with a panel discussion on The Future of the Academic Monograph; four panelists and two respondents will address issues from their personal perspectives including academic librarianship, academic publishing, and academic bookselling. Edinburgh plays host to a series of debates around digital text during the week. The first is on the 9th November and the debate will cover online text and learning, the second on the 10th covers digital text and publishing, the third on the 11th covers open access textbooks, and the fourth on the 12th covers online learning. With speakers from eclectic backgrounds and unique perspectives these offer informative and insightful discussions. The week in Edinburgh finishes up on the 13th with a debate on the subject Is the Book Dead? This promises to be an interesting event with speakers from the Bookseller’s Association and Scottish Publishing covering issues about the future of books and reading. Liverpool launches their Academic Book Week events with a talk at the University of Liverpool with Simon Tanner, from King’s College London, and member of the project team, as keynote speaker, and a subsequent overview of the week’s events. Simon will speak on ‘The Academic Book of the Future and Communities of Practice’ with Charles Forsdick and Claire Taylor responding from the perspectives of Translating Cultures and Digital Transformations, respectively. On the 10th November Claire Hooper of Liverpool University Press and Charlie Rapple from Kudos present ideas on how to promote your academic book via Kudos and social media, a fitting topic when thinking specifically about the future of the academic book. On the 11th Gina D’Oca of Palgrave MacMillan will speak about open access monographs and a representative from Liverpool University Press will give their perspective. The last event in Liverpool takes place on the 12th and will focus on the academic book as a free available source for students. Academics, librarians, and university presses should work together to create free open access sources for students, but how? Find out here! John Smith’s Glasgow hosts all of the events taking place in the city throughout the week. The first night on the 9th the bookstore will stay open late and from 5:30-7:30pm all customers will receive special one-night-only discounts on items not already discounted! There will also be refreshments so there’s no excuse not to come and celebrate the longstanding partnership between John Smith’s and the University of Glasgow. On the 10th the bookstore hosts the launch of Iain Macwhirter’s new book, “Tsuanmi: Scotland’s Democratic Revolution”. On the 11th – purposefully coinciding with Armistice Day – John Smith’s caters an evening of discussion and readings exploring Edwin Morgan’s unique contribution to Scotland’s poetry in response to war. With readings and contributions from friends and trustees of Edwin Morgan this evening will be a personal and creative contribution to the week. John Smith’s unique events don’t stop there! On the 12th Louise Welsh, Professor of Creative Writing at Glasgow University, discusses her recent novels and the editing of a new anthology of supernatural stories – a perfectly atmospheric evening for the cold autumn evenings. John Smith’s last event takes place on the 13th, author and astronomer (what a combination!) Dr. Pippa Goldschmidt discusses co-editing a new collection “I Am Because You Are”. She will be joined by contributor Neil Williamson as they talk science and fiction. London has a large amount of events happening starting with a debate focusing on how the evolving technologies of the book have changed the way we read at The School of Advanced Study. The 10th sees two other events: Blackwell’s at UCL hosts the book launch of Shirley Simon’s “Narratives of Doctoral Studies in Science Education” and Rowman & Littlefield International offer a panel event on interdisciplinary publishing and research. The question being asked is how do academics and publishers reach a diverse, multidisciplinary audience and the panel will be followed by a Q&A session. The 11th plays host to two events: Palgrave MacMillan’s premiere academic series in the history of the book is being launched and elsewhere Charlotte Frost outlines the future of the art history book. She asks ‘what should the art history book of the future look like and what should it do differently for the discipline to evolve?’ Since 2015 marks the 400th anniversary of Richard Baxter’s birth, a symposium to honour his life and assess his significance takes place on the 13th, as well as a panel discussion at the Wellcome Collection specifically targeting questions related to STM publishing and issues facing humanities research. The 12th November also sees The Independent Publishers Guild Autumn Conference with representatives from Academic Book Week, Dr Samantha Rayner, Richard Fisher, Eben Muse and Peter Lake, speaking on a panel. We have one event happening in Hertfordshire in conjunction with the University of Hertfordshire Press and Hertfordshire Archives and Local Studies! This is for anyone considering getting their research published as it addresses local history and publishing combined in an effort to help and advise about writing book proposals and approaching publishers. Similarly, in Cardiff there is an event on the 11th November utilising a forum to discuss innovative Open Access academic publishing ventures. In Manchester on the 11th there will be a panel discussion presented by Digital Humanities Manchester and the University of Manchester Library as they get to the root of the issues presented in academic publishing. Multiple perspectives will make this a fascinating event as panelists attempt to answer questions such as what is the future of the academic long-form publication in the evolving publishing landscape? And is there still a future for the physical book? And in Bristol on the 10th November a panel tackles the questions facing the academic book from the perspective of the panel and the audience. In Sussex on the 11th there is a similar panel discussion; three speakers from different backgrounds grapple with the transformation of the academic book and what that will mean for the future. On the 11th in Sheffield an important and fascinating question is asked: Should we trust Wikipedia? Librarians and scholars from a range of backgrounds discuss the validity of information on there and address questions of integrity surrounding digital publishing. Sheffield finishes off Academic Book Week on the 13th with an open afternoon in the University of Sheffield Library’s Special Collections, introducing visitors to treasures from their collection. Dundee and Stirling partake in the excitement of the week also! On the 11th November Dundee presents the Wikipedia Edit-A-Thon as part of the NEoN Digital Arts Festival and on the 13th a mini-symposium focused on the intersection of tradition and craft with the digital transformation of art and design. In Stirling on the 12th John Watson, Commissioning Editor for Law, Scottish Studies & Scottish History at Edinburgh University Press will be speaking to students of the Stirling Centre for International Publishing and Communication about academic publishing and his role as a commissioning editor. When we mentioned that events were happening all over the country we really mean it! If you are near the Midlands, DeMontford University is bringing together PhD students to think about the future of the English PhD and the future training of English academics. And last but not least on the 12th in Nottingham Sprinting to the Open FuTure takes place – a panel discussion event bringing together those who interact with academic books to explore questions about how students and staff publish, and the challenges they face. With so much happening, it will be hard to choose – we know we are already having trouble deciding between events. Come to as many as you can, and help support the future of the academic book!